The share of these services performed in the outpatient setting increased between 2009 and 2017. For this set of services, the average price was always higher in an outpatient setting than an office setting. Health care costs for the commercially insured have increased substantially in recent years, as detailed in the 2017 Health Care Cost and Utilization Report. In addition to increases in the average price of the same services year-over-year, prices of services may increase when there are changes in where they are performed, e.g. in a doctor's office or emergency room. One trend affecting rising prices of health care services is hospitals buying physician practices. According to a report from Physicians Advocacy Institute, the number of physician practices acquired by hospitals grew by 36,000 between July 2012 and July 2016, doubling the number of hospital owned practices in a four-year period. This trend is important, as services performed in an outpatient setting may come with a facility fee, which is an extra payment in addition to the service rendered that is intended to cover the cost of maintaining the facility. To address these price discrepancies in the Medicare program, the Centers for Medicare & Medicaid Services (CMS) recently finalized site-neutral payments for clinic visits – meaning that CMS will reimburse these visits at the same rate, regardless of where they occur. This new policy, however, does not apply to the commercially-insured population. We examined a set of services that are a subset of ambulatory payment classifications (APCs), defined by CMS as outpatient services with similar intensity and resource utilization, and determined by MedPAC to be safe and appropriate to provide in freestanding physician offices, despite being frequently performed in the outpatient hospital setting. This work expands on an analysis we performed in collaboration with the Wall Street Journal. We've now incorporated data from 2017 and made the data for all services available to download. Overall, for the included services, the share performed in an outpatient setting (as opposed to an office setting) rose modestly from 11.1% to 12.9%. The shift from office to outpatient settings varied considerably by service. Some services, including echocardiograms and drug administration, had larger shifts towards outpatient settings, while other services saw little change. The share of level 3 diagnostic and screening ultrasound visits performed in the outpatient setting compared to the office setting rose from 20.9% to 25.2%. 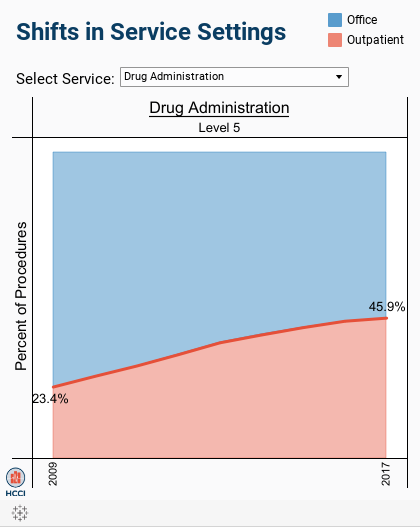 In 2017, 45.9% of level 5 drug administration visits occurred in outpatient settings, compared to 23.4% in 2009. The share of level 4 endoscopy upper airway occurring in the outpatient setting remained steady from 2009 to 2017, at around 19%. The average price for a given service was always higher when performed in an outpatient setting. Average prices also tended to grow faster for the same services when performed in outpatient settings compared to office settings. The average price for a level 3 diagnostic and screening ultrasound visit increased 4% in office settings from 2009 to 2017, from $233 to $241, and 14% in outpatient settings, from $568 to $650. 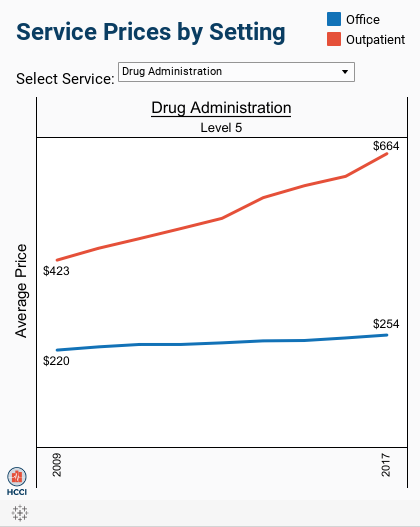 The average price for a level 5 drug administration visit increased 15% in office settings from 2009 to 2017, from $220 to $254, and 57% in outpatient settings, from $423 to $664. The average price for a level 4 endoscopy upper airway visit increased 14% in office settings from 2009 to 2017, from $463 to $527, and 73% in outpatient settings, from $1,552 to $2,679. Use the interactive tool to see the trends of average prices by setting from 2009 to 2017. Individuals younger than 65 with ESI were included in the analysis. The sample was limited to individuals with valid age and gender and enrolled in a preferred provider organization (PPO), health maintenance organization (HMO), point of service (POS), or exclusive provider organization (EPO) plan. If an individual had a negative total cost, defined as the total out-of-pocket payment plus the amount paid by the insurer, for at least one visit in the physician office or outpatient setting, the individual was excluded from the analysis. In total, we looked at 396,121,164claims from 44,638,261 individuals from 2009 through 2017 in this study. We flagged claims from 2009-2017 with Current Procedural Terminology (CPT) codes in 46 APCs meeting the criteria above. Each service was defined as a unique patient, date, and CPT code; if a patient had multiple claims for the same service (i.e., CPT code) on the same day, it was counted as a single service and the costs for that service were summed. If the claim(s) for the service did not have a valid revenue center code, the service was considered rendered in a physician’s office. If the claim(s) had a valid revenue center code, the service was considered rendered in an outpatient setting. If a patient had a claim for the same service on the same day in both settings (i.e., one with a revenue center code and one without), it was counted as an outpatient service.